It appears that the last week or so it was "time to get ill" although not "ill" in the Beastie Boys sense of the word, more "ill" in the revoltingly infectious, night of the living dead, dawn of the dead, day of the dead , mid afternoon and tea time of the living dead kind of way. Bleugh! We're rounding the corner of this episode of the lurgi it seems, so we celebrated with a shed load of cookies. 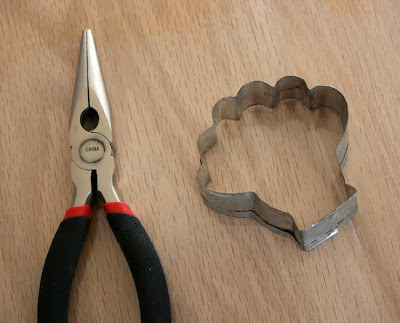 We didn't have any fall themed cookie cutters, so I thought I'd try using a pair of pliers to bend a round cookie cutter into a turkey shape. It worked pretty darn well. 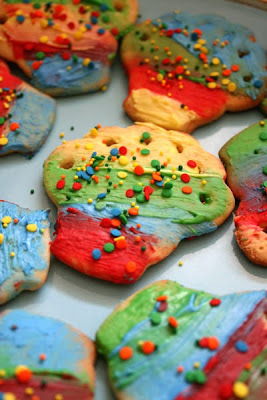 I might have to stock up on a few round cookie cutters that we can customize to our own shapes in the future. 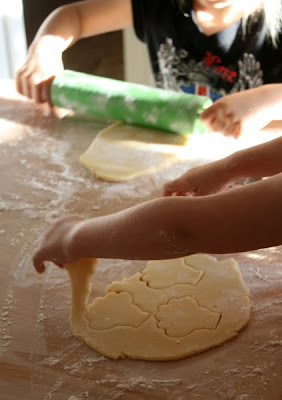 The kids cut out a load of turkeys and circles and even around their own hands with a butter knife to make our sugar cookie shapes. 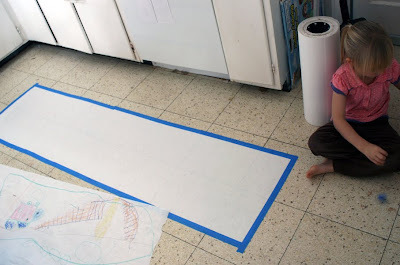 We don't have a surface in our kitchen that isn't tiled, so I have a large piece of plywood that I taped a clear plastic sheet to. 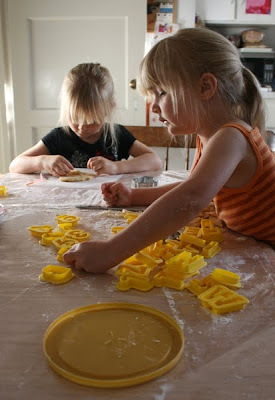 We plonk that on our kitchen table to roll out icing, dough, pastry etc. It wipes clean nice and easily and is a piece of cake to stash away because it's light and very thin. I got out a bunch of plastic letter and number playdough cutters that we found at a garage sale for them to try, but my three year old just wanted to arrange them in order rather than cut dough with them, which was fine and dandy. 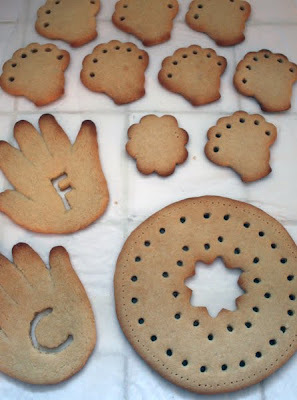 We did manage to stamp out their initials in each hand print cookie though. 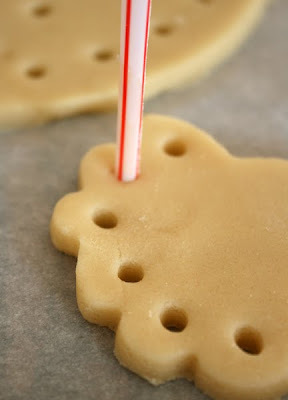 I used a straw to cut out holes in the cookies like we did with our salt dough ornaments last year. 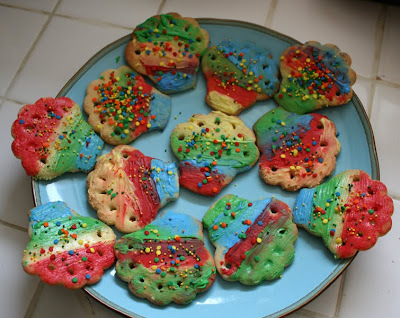 I thought that it would make it interesting to try and make cookies that could be used as threading/lacing cards. 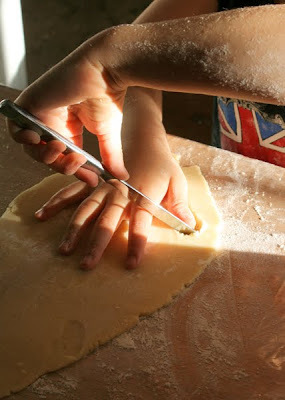 I found that once I had baked the cookies, the holes although still there had closed up a lot, so while they were fresh out of the oven and still soft, I just punched the holes again with another straw. 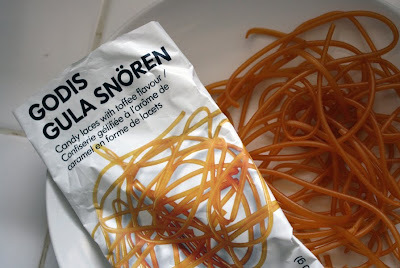 We had a packet of caramel flavoured laces from Ikea that were pretty long and looked like they would do the trick. Red laces would be yum too, although I've not seen those in the US. 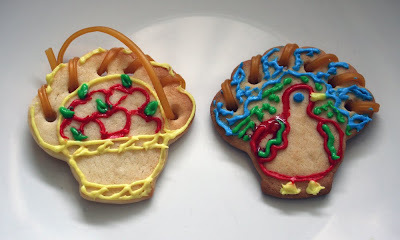 The kids enjoyed threading the edible laces, and the cookies were strong enough that they held up to the lacing antics just fine. Then they squeezed some icing on them. 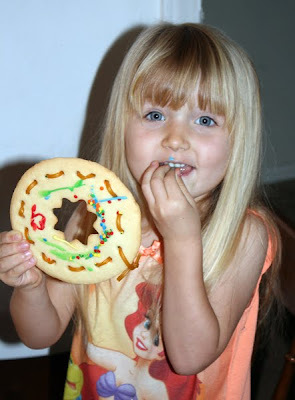 It's not every day that mum lets you eat a cookie the size of your head! 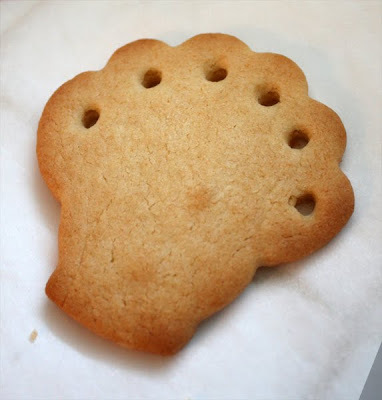 The cookie cutter shape I made was supposed to be a turkey, but it sort of looked like a basket too. 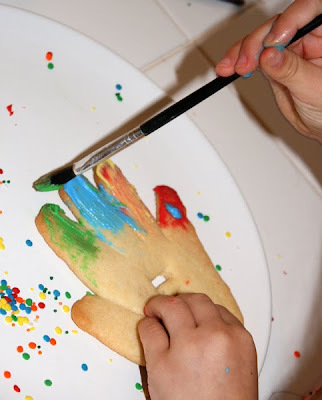 Anyhoooo, the ages my kids are, we weren't going to be able to make such a detailed decoration, so they just painted the icing on them willy nilly with paint brushes to make rainbow cookies, so the turkey thing went out the window. 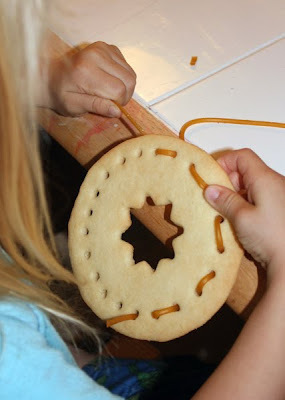 It was still good to know that it's easy to make custom cookie cutters that way though. 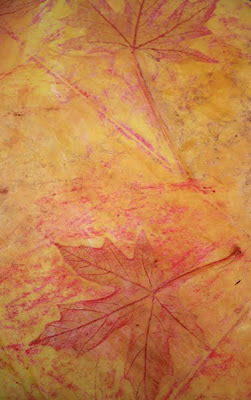 It would be lovely to make a fall leaf shape cutter and then paint on the yellow and red icing. Bet that would be really pretty! Mmmm cooooookies. Sometimes food? Pah! Your're not fooling anyone Cookie Monster! 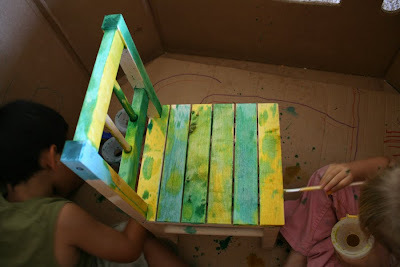 Over a year ago we got some cute wooden kid chairs, and rather than paint them up myself I wanted to get the kids involved. They were only two and three years old back then, so it had to be simple. 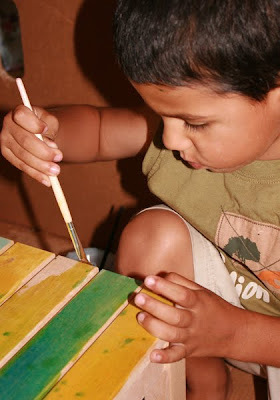 I decided to use the carcass of the old melon box wendy house for them to paint in, as it was too cold outside at the time. 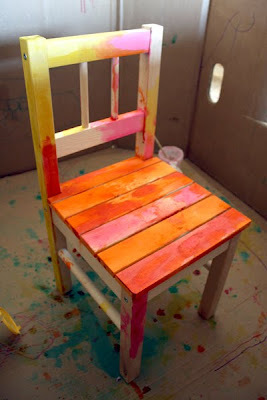 I gave them pots of watered down food colouring to use as a stain for the wood. I figured if I gave them only two primary colours per chair, then we'd end up with a nice tertiary colour mixing from them, rather than a nasty brown/grey bleugh. One chair was yellow, green and blue. The other chair was Yellow, orange and red (threw in a bit of pink too for 70's overload). 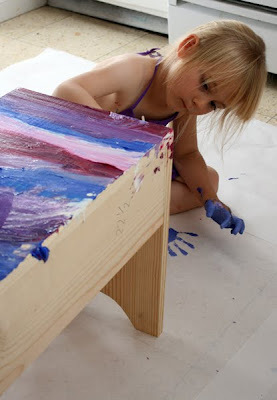 Earlier this month their dad made a wooden bench and the kids got to paint that up too. 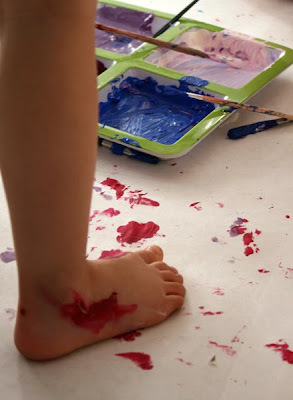 This time they used acrylic paint and made one stonker of a mess. 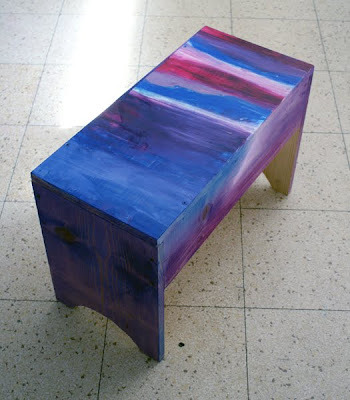 They enjoyed it though, and we ended up getting the third combination of primary colours by using blue, purple and red. I think I mentioned in a post a while back that we were trying to make a little wendy house in the kid's bedroom for them (They won't fit in a melon box now) We call them "Ty Bach" back in Wales, which just means "little house". 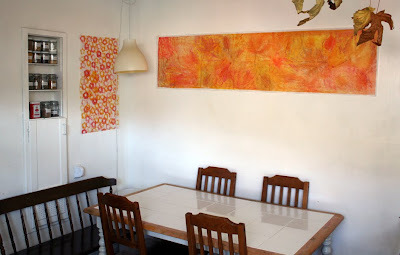 We rent our home and so there wasn't any wall painting or full on building that we could do for it, plus our car is small, so we were limited with what we could pick up from Craigslist or the hardware store. Things did come together though eventually and the kids have been playing in their Ty Bach with their friends for about six months now. It takes up nearly the whole of their bedroom, with the beds squished in the corner, but they love it and I'm so glad that we did this now, before they are too old to really get the most from it. It started over a year ago when I babysat a friend's kids while she went to some job interviews. 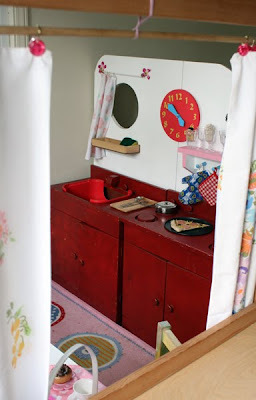 When she landed a job at an elementary school and they decided to upgrade their play house kitchen, my friend snagged the whole set of fire truck red wooden sink, stove and fridge for us! I know, way too awesome! Another friend gave us their old white play fridge unit too (thank you Tina and Michelle!) We kinda had a bit of a Golden Gate Bridge thing happen, in that I had plans to strip and paint the kitchen gear, but for weeks I couldn't find the time and then when it came down to it, we'd grown fond of the strange, old, well worn, obviously loved, bright red, so it stayed. 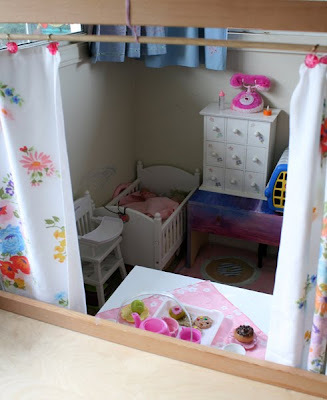 We moved the chest of draws into the middle of the room, so that the back of it could be a wall of the house, then we put together a fake window frame that was attached to the draw unit (this doubles up as a puppet theatre some days). The curtains are just a couple of matching old pillow cases from Goodwill. If you look carefully, you can see that the cardboard pizza is still going strong after all these months. 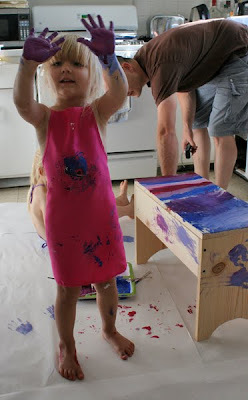 Yeah, the sink is an upturned plastic footstool, that just fits the hole that was in the play furniture. It's not classy, but it does the job. 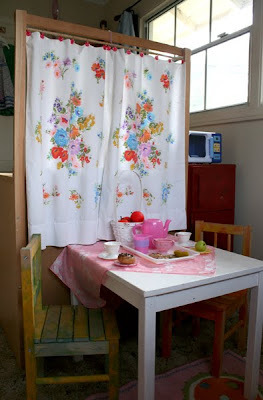 We keep books in the cupboard under the sink, because the girls like to be able to go and read in their little house. I should tell you about all the secret places we keep books in a post some day, because we're a bit book mad here. 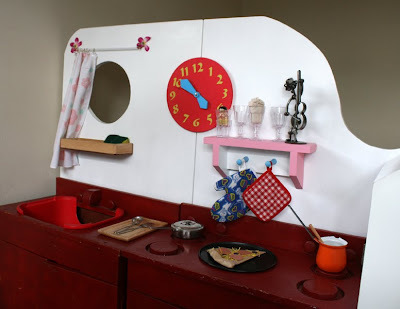 We didn't have many tools, just a Proxxon (like a Dremmel) and a jigsaw, so the back board that forms the wall behind the sink and stove was made using two sheets of chipboard, painted white and hinged together, so we can fold them up if we need to. Hubster jigsawed out a little round window over the sink and a curved bit that flowed into the shape of the fridge unit. It isn't attached to anything, just sandwiched between the footboard of a bed and the kitchen units. It's very stable though. The carpet was from Ikea and I liked it because it had a bit of red, pink and blue, which helps the crazy coloured kitchen units fit in a little bit, but mainly because it covers up the nasty brown dead buffalo of a rental carpet that fills our home. 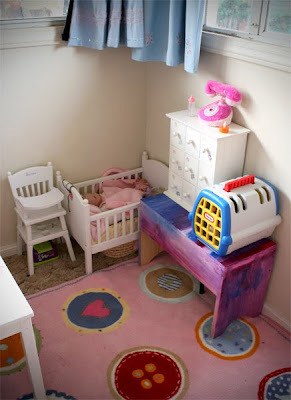 The American Girl highchair and crib were from a garage sale and the teeny chest of draws that all the baby doll's clothes and gear live in, was from a thrift store, as are the two little shelves that we attached to the back board. The toy microwave next to the little window was from Goodwill, and although the children have plenty of fun with it, I loathe it, because it makes the sound of the hospital monitors when someone goes into cardiac arrest! Who thought that was a good idea?!?! I remember the Ty Bach at my school from when I was six years old very clearly. 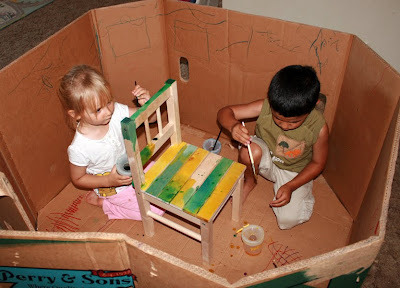 I hope this Ty Bach helps my kids to make some equally good memories of childhood imaginative play. 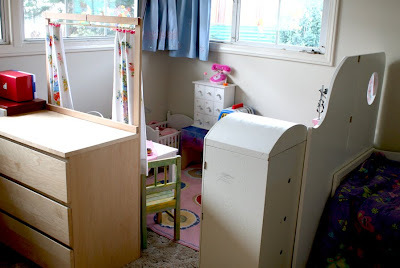 If you've made a play house area for your kids and have blogged about it, do let me know in the comments, because I'd love to see! I really like the ones I've seen that people have made out of old entertainment centers, like this one on "Making Do with the not so new". If we were able to transport something that big then I think we would have gone that route, because they come up in the free section of Craigslist quite often. 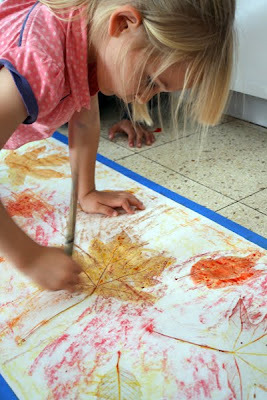 Lots of lovely leaves around to make beautiful decorations with! Whooo! 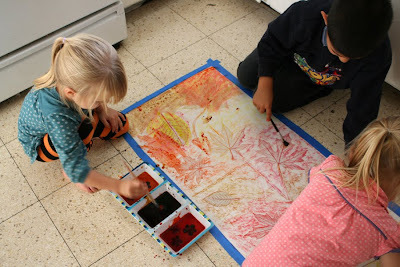 This activity was really easy and I always like the art activities where kids can work on one thing collaboratively. 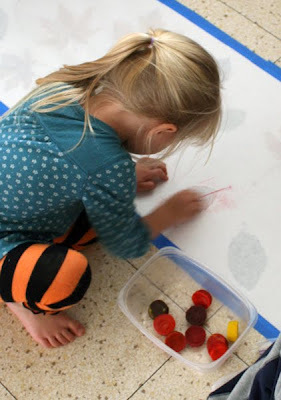 Especially something that is all about the process and not how well you can draw etc, so the three year olds were able to contribute just as much as the five year olds and you can't even tell which bits of the art work were done by which kids. It's just one lovely mural that they all had a hand in producing. 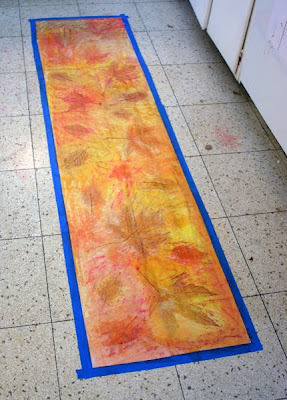 I used painters tape to stick a big strip of butchers block paper to the kitchen floor. I used regular packing tape a while back and had to resort to scrubbing the floor with isopropyl alchohol to get it off, which I wasn't expecting. Here's my older daughter helping me to cut bits of tape. 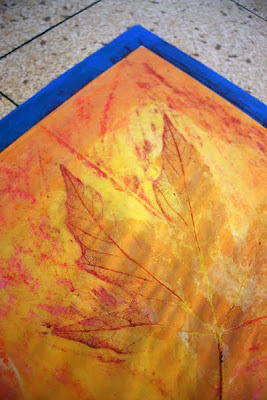 One that was done, the kids positioned the leaves with the veins facing up. 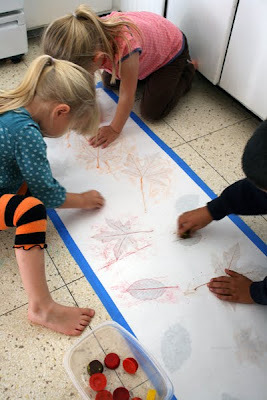 We took our time and arranged them so they filled the paper, then rolled over another layer of the butcher block paper and taped that down too. 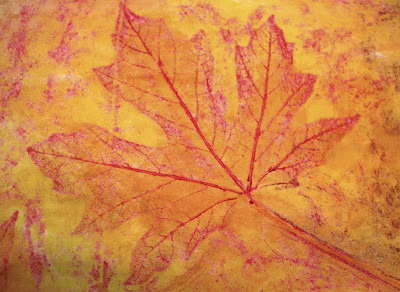 A few days ago we made some autumn coloured crayon cakes. 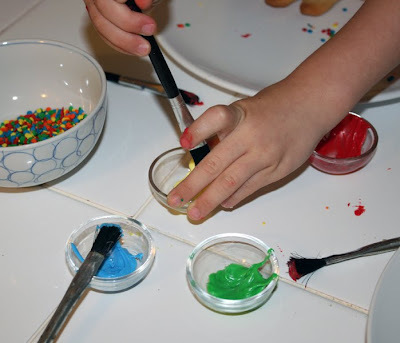 Crayon cakes are ace, we've been making them ever since the girls were teeny, because they are so much easier for littlies to get a grip on when they start learning to make marks on paper. 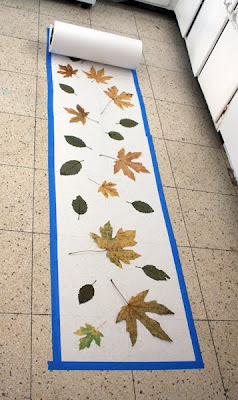 They are even better for leaf rubbing! I haven't done a post on crayon cakes, because I'm sure there are lots out there already. Here's a good one from WhiMSey Love. The kids had at the paper with the crayons for about 20 minutes, all haphazard with the different colours. The shapes of the tiled floor came through in the rubbings too, but it's not that distracting. 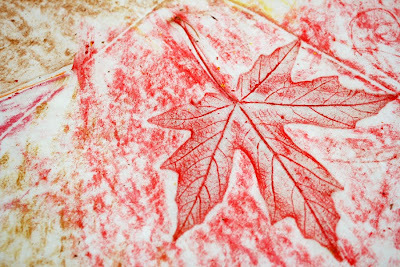 The leaf rubbings were rather pretty just on thier own, but I figured we could get another 20 minutes or so out of this activity, if I watered down some food colouring and let them paint over the rubbings to get a wax resist effect. 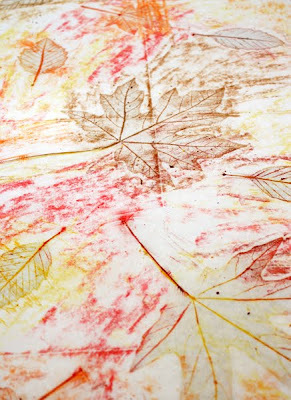 They thought this was really cool, especially when the yellow rubbings showed through the darker food colouring. We ended up with what I think are quite wonderful textures and colours. Here are a few close up pics to show you what I mean. 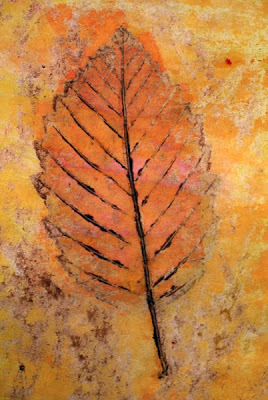 And here is our fall mural proudly in place in the kitchen. 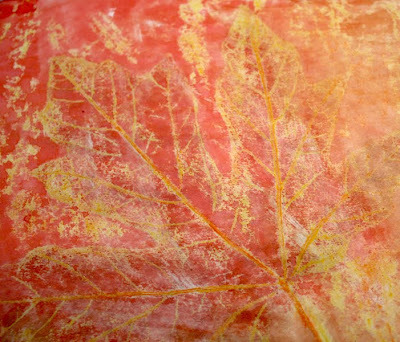 I thought about making it into a poster with "happpy thanksgiving" written on it, but really I don't want to cover up any of the leaf rubbings with text, so we'll make a separate banner and enjoy the mural as it is. Jen from "Creative and Curious kids" gave me the Kreativ Blogger award. I'm supposed to tell you seven things about myself, but you'll make do with just one if it's proper weird won't you? I can juggle fire clubs. Not that there's a lot of call for that day to day at the moment. Might come in handy one day though, I suppose, if I have more than two things that are simultaneously on fire and I don't want them to get on the carpet?!? Shea from "All Things Shea" gave me the "Neno's Award. As part of that I'm supposed to tell you why I blog. 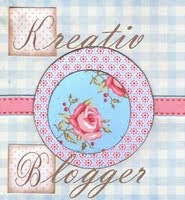 I'm sure the reasons I blog are the same reasons that a lot of mums blog. It's partly to create a diary with photos, so that my young kids will have something to look back on. My memories of being 5 and younger are pretty sparce, so I'd like them to be able to see what we got up to before I forget most of it too. There's about 80 projects on here from 2009, and I'm sure if I hadn't blogged about them then I would barely be able to recall twenty or so by now. The other reason is to reach out and connect with other people that are into the same sort of nonsense. I've met some rather lovely people through my experiences blogging and it's great to hear from other people around the world who have tried out some of the projects on the blog and had fun with them. Yay blogging! 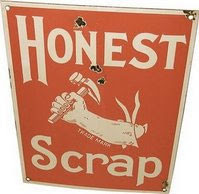 Basia from United Teaching gave me the "Honest Scrap" award (so long ago that it's embarrassing that I haven't said thank you yet!). Not sure what the rules and regs with that one are, but it looks like it might be useful if someone starts shooting at me. Thank you ladies, not nessesarily for the awards themselves, but just getting in touch and taking the time to be friendly like. You know that I don't do well following the blog award rules and regulations. I do like to take the opportunity to point at something worth pointing at though, so I want to point you at this story that one of our readers emailed me about. It's a disasterously upsetting reality that really hits you hard when you take just a moment to empathize. I hope that we can all do something over the holidays, for someone we don't know personally, that needs something extra, whether it's a child in Noah's circumstances, or troops far from home, or people with no home. There are a lot of people out there that a stranger's generosity would really make a difference to. Noah's story reminded me of that, when I was all caught up in making gifts for the people that I know. Now I have some research to do on where I can direct my efforts. Please do let me know if you have anything you plan on making or doing for a stranger this holiday! 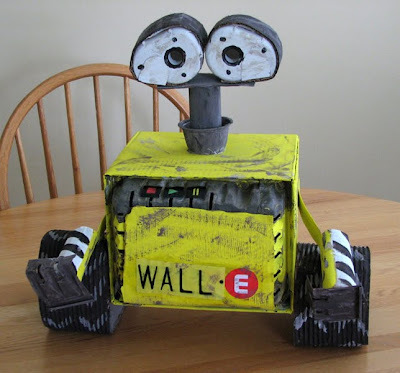 To end on a less harrowing note... Do you remember the Wall-E that we made out of recycling a while back? He had his time in the sun with the kids and has gone to be with a group in Sacramento called ReCreate. If you live local to them then go check it out. They are doing a fantastic job teaching children about trash, natural resources, conservation, and personal choices in consumption and waste, then allowing the kids to get creative with a large library of donated junk that would otherwise be sat festering in landfill somewhere.